The circus comes to Camden Town! Away from the traditional clowns and lions, displays of acrobatic skills are becoming ever more prevalent and popular. 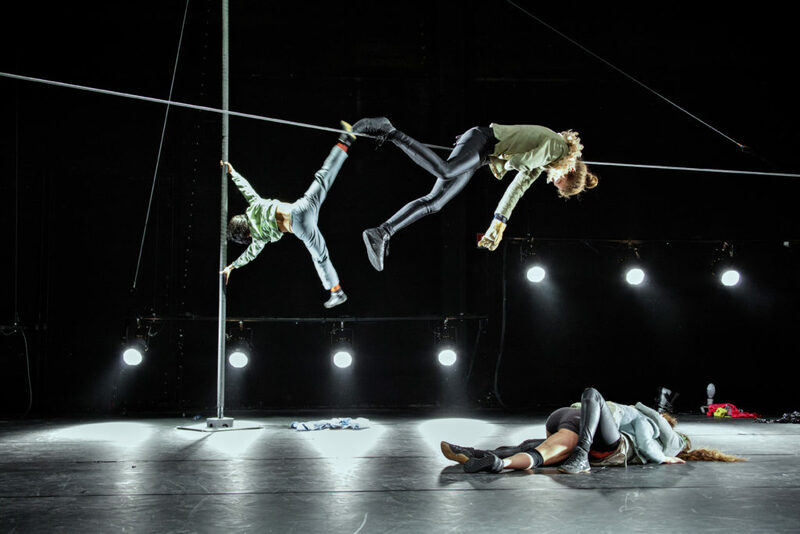 As part of CircusFest at the Roundhouse, the all-female Groupe Bekkrell present their take on the discovery of radioactivity (Henri Becquerel, 1896) with acrobatics, humour, transient lighting and enveloping sound. In ‘The Bekkrell Effect’, four women explore the decomposition of the atom, creating instability and chaos, yet producing shapes and patterns. In the beginning, we see form and formality, the artists in unison, but, progressively, the four disperse. Together, but individually, they create scenes, sights and stunts with their four specialities – Fanny Sintès (rope), Sarah Cosset (Chinese mast), Louisa Wruck (tightrope), Chloé Derrouaz (tumbling). The mood of their first entrance, the costumes and the opening music take an unconventional stance on the typically colourful big top experience and we are gradually drawn into the mechanics of the show and the personalities and relationships within the troupe. A superior sound system at the Roundhouse allows the audience to immerse itself in Thomas Laigle’s original, dramatic soundtrack. It is imaginatively designed around patches of silence and a light touch of clowning from the inventive speech technique. The lighting (Clément Bonnin) is integrated into the unstable nature of the spectacle. The lights themselves move around the stage, changing position and angles in coordination with the action, though still spotlighting and dimming to build anticipation in the customary fashion. However, it is uncertain whether the manual change of filters is an intentional addition to the turmoil or consequence of the mobility. In keeping with the idea of falling apart, the costumes cleverly mutate from austere dress to diverse combinations as the four women’s personalities emerge. ‘The Bekkrell Effect’ sets out to represent the idea of constant movement and energy and show how the impression of chaos can be beautiful from afar. It brings together pleasing, artistic work, especially on the Chinese mast and rope, some elegant tableaux and whimsical comedy. The clashes of personality come across well and both the opening and closing poses are visually striking, but the level of stunts is underwhelming. The preparation of equipment incorporated into the show often takes too long and, with only the outline of an idea to follow, expectancy fades. Clearly, this is not a traditional circus format and the depiction of turmoil implies a lack of shape, but even from a distance the show needs more discernible structure and a slicker pace to make it an explosion of energetic radioactivity.